Materials that respond to the application of a magnetic field are described as magnetic materials. Magnetism can be attractive (paramagnetism) or repulsive (diamagnetism). Some materials are permanent magnets, this mess that their magnetic fields are persistent and they are caused by ferromagnetism. Magnetic phenomena are closely related to electricity: a magnetic field can be created by moving electric charges. Electromagnetic radiation, such as light, is a form of energy emitted and absorbed by charged particles. It can exhibit a wave-like behaviour as it propagated through space. It is possible to map the magnetic field of an object by measuring the strength and direction of the field at various locations. By following the arrows drawn you end up with field lines for the field. 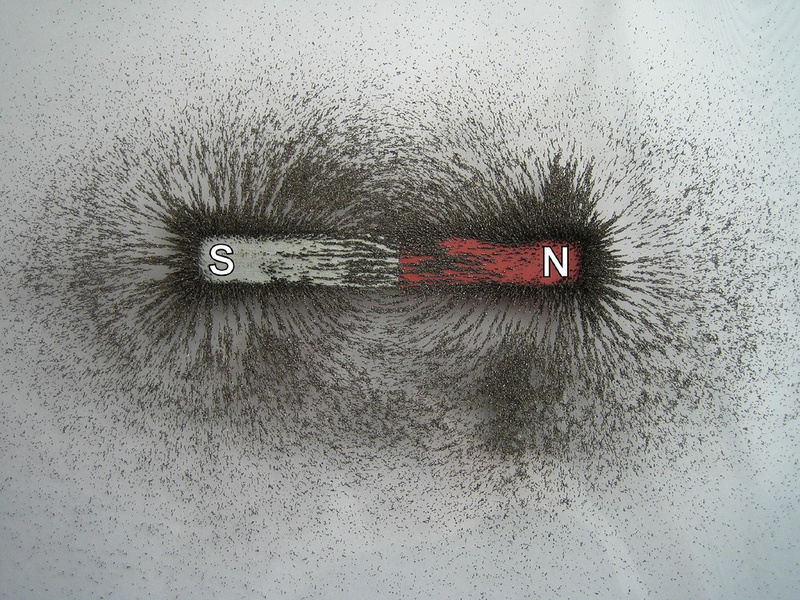 A map of this sort can be visualised, for instance, by doing a very simple experiment involving a magnet bar and some iron filings (see image above).